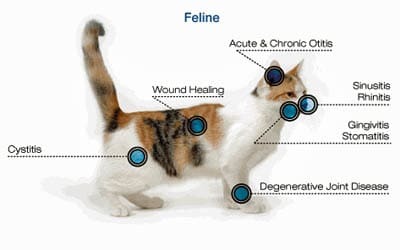 Plaza Del Amo Animal Hospital is now offering laser therapy. Our K-Laser is a Class IV Laser that provides surgery-free, drug-free, and non-invasive treatment of a variety of disease problems. The laser uses a beam of light that deeply penetrates tissue and induces a response in the cells known as photo-biomodulation to reduce pain, to reduce inflammation, and to speed healing. 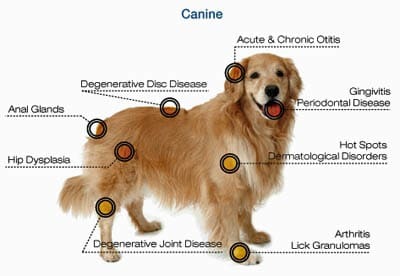 Plaza Del Amo Animal Hospital is proud to offer the same type of therapy that professional and Olympic sports teams, like the LA Lakers and LA Angels of Anaheim, and many more use to treat sports injuries to get their players back on the court or field as quickly as possible. Call us today to make an appointment or if you have any questions about the K-Laser therapy. "Lady is my very large 11 year old German Shepherd. She is approximately 100 pounds (we're working on getting her down to 95). Lady has the typical spinal and hip dysplasia problems inherent in large dogs and has always been on a plethora of pain medications to keep her comfortable and active. She's still a puppy at heart - enthusiastic, alert and eager to please. Unfortunately, she was declining badly physically and I had to think about putting her down. Her quality of life is the only thing that matters. The pain in her eyes when she looked at me was heartbreaking. Her mobility was decreasing rapidly and the meds weren't really helping anymore. Dr. Moeller encouraged me to try the laser treatments and now Lady is on a long-term maintenance schedule. I (and Lady) couldn't be happier. Of course there is no cure and she will never be as active as when she was younger. Still, if she has this improved quality of life even for a matter of months, I am so grateful for those months. Thank you Dr. Moeller. You are literally a lifesaver!" "Our Samson is the patriarch of the neighborhood. At 13, he still likes to roam and greet our neighbors in exchange for treats. 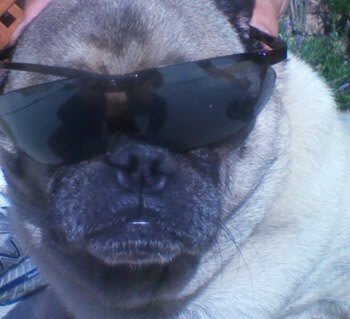 We found about a year ago he was really struggling with mobility and asked our veterinarian at Plaza what could we do. When K-Laser was suggested we had some reservations but decided to proceed. The results were wonderful! After a series of services we found that Samson was back to strolling the neighborhood and snacking as before – never missing a step. Thanks so much Plaza Del Amo Animal Hospital!"